CARBON FARMING: The practical approach to managing land that increases soil carbon, protects and enriches the soil, and boosts biodiversity and landscape health. The author of this Handbook (in the hat, above) is a woolgrower from Central Western NSW who has been actively campaigning for soil carbon rights for farmers since it emerged as an issue. No corporation or government agency "pays the piper". His advice is independent. Michael Kiely, Convenor of the Carbon Coalition and Soil Carbon authority, has also been a professional writer and editor for 35 years. He has earned a reputation for fairness and objectivity among the scientists and farmers he deals with. 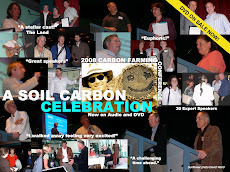 The Carbon Coalition has been in the front ranks of the campaign in Australia and saw the birth of the “Movement” in New Zealand, America, India and South Africa. For three years the Convenors Michael & Louisa Kiely have funded the lobbying and outreach program of the Coalition. "They should be awarded the Nobel Prize,” according to Andre Leu, Chairman, Organic Federation of Australia. "You single-handedly barnstormed the issue onto the national agenda,” says Matt Cawood, The Land Newspaper. You can order your copy today by PayPal. Or you can telephone (612) 6374 0329. 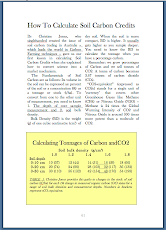 Published with the kind support of YLAD LIVING SOILS. Ylad Living Soils pioneered the on-farm humified composting movement, supplying education, products and equipment that are widely respected and adopted. The most comprehensive book about Carbon Farming ever written. The Carbon Farming Handbook covers every major issue and answers every major question you might have. 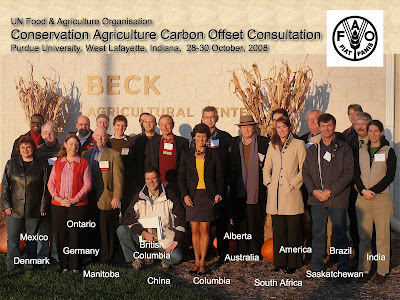 The price of The Carbon Farming Handbook is A$59.95. Postage and handling $19.95. The price includes a donation to the work of the Carbon Coalition Against Global Warming which has been campaigning for four years for farmers to be given the right to be part of the carbon market and transform the way we farm to restore our soils and the landscape to health. The Carbon Farming Handbook reveals the secret techniques the scientists use to calculate how much carbon is in soil.